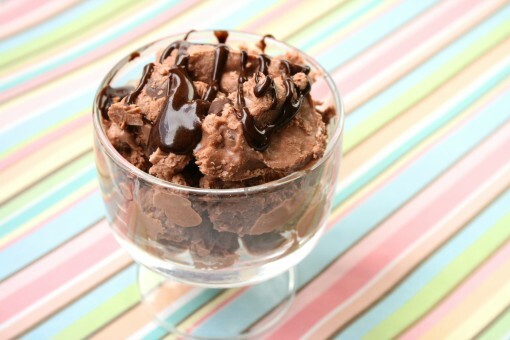 Double Chocolate Frozen Yogurt was posted on January 30th, 2012 and is filed under Desserts, Gluten Free, Kid Friendly, Low Carb, Protein, Recipes, Snacks. This entry has 13 comments. You can follow any responses through the RSS 2.0 Comment Feed. I think one of the things that make it so hard for people to stick to a healthy lifestyle/diet is going without sweet treats. I know I couldn’t live without chocolate.So I buy dark chocolate and make healthy desserts. I also keep moderation in my head and try to stick to one or two *bad* treats a week. A little while ago I shared my ultra simple chocolate chip frozen yogurt…and today I’m sharing with you my new favourite…Double Chocolate Frozen Yogurt! It’s so easy and fantastic. Honestly, don’t you want to dig in? Besides….since this is healthy, low calorie, protein packed, and easy…why would you not want to? 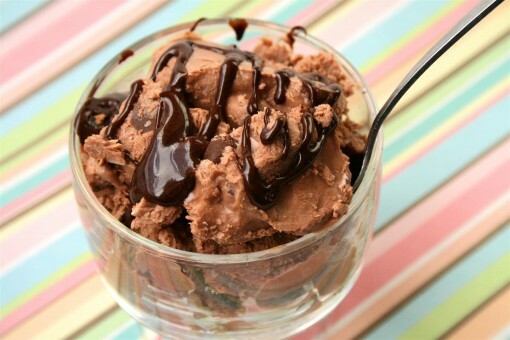 Just make the basic instant frozen yogurt recipe here and add a couple teaspoons of this delicious chocolate sauce! Note: You can also skip the sweetener in the basic recipe, the addition of the chocolate sauce made it perfect in the sweetness department. Whisk those ingredients together. You can use it in your frozen yogurt recipe right away, but I like to let it sit for a bit. This makes it thicken to a fudgy-like sauce (soooo good). You will have leftover sauce! Stir it into your frozen yogurt. Make sure to add some dark chocolate chips to make it decadent! Tonight we’ll be home…but obviously…not before we get some shopping done! On my wish list that I probably won’t get – brown boots! On my practical list that I probably will get – a new notebook. Number 5 on my new year’s resolution is killing me. Looking forward to getting back home to study, do some running (our treadmill is getting fixed this week), and hopefully finish some important projects. Hopefully I’ll get another workout post up this week too! What’s your favourite kind of ice-cream or frozen yogurt? Definitely will be trying that chocolate syrup! I have also made the swap from ice cream to frozen greek yogurt. Straight chocolate does it for me! One scoop is all that it takes to satisfy my craving too! Looks really delicious! I’m craving chocolate right now – will have to try this out for my next dessert. Thanks for sharing! I love your idea of motivation Mondays…Let us indeed start the week right. 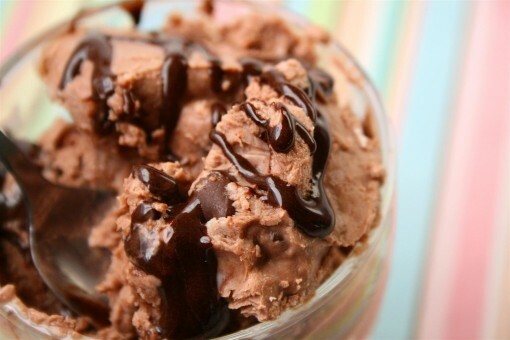 Jumpstarting with a double chocolate scoop is a fantastic suggestion. Great post! I’m so craving chocolate right now. Yum! You know I like to make mine with a frozen banana base. oooh – I wish this was my dessert right now! Thank you for this post. Looks so incredibly delicious…love chocolate! Donna – It doesn’t matter what cocoa you use. I just prefer to use very little processed cocoa. Leave a comment...I'd love to hear from you!